This genuine Acura part is guaranteed by Acura's factory warranty. Your vehicle deserves only genuine OEM Acura parts and accessories. To ensure reliability, purchase Acura part # 08V67TK42C0K Back Up Sensors(Forged Silver Metallic - exterior). 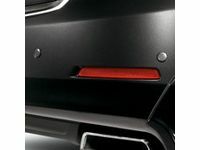 It is sometimes referred to as Acura Back Up Sensors. Our Acura parts and accessories are expedited directly from authorized Acura dealers strategically located all across the U.S. and are backed by the manufacturer's 12 month, 12,000 mile warranty. OEM Acura parts are the best for restoring your vehicle to factory condition performance. This part fits specific Acura TL models. Affordable, reliable and built to last, Acura part # 08V67TK42C0K Back Up Sensors(Forged Silver Metallic - exterior) stands out as the smart option. Acura Parts Warehouse is your prime online source with the biggest and best selection of genuine Acura parts and accessories at giant discounted prices. We have the OEM Acura parts and accessories you need at the lowest possible prices. Acura Parts Warehouse has you covered no matter what type of Acura vehicle you drive.